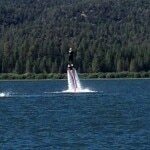 A flyboard is like a water-powered jet pack that allows the thrill-seeker to fly above a body of water like Iron Man but without the rust issues. 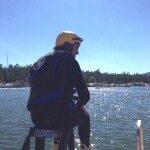 The professional team at Action Aqua Flight at Big Bear Lake, California, was willing to train me at this extreme watersport. It is one of the few places in the country to offer this experience currently. Big Bear Lake is beautiful, but never gets that warm, even in summer. 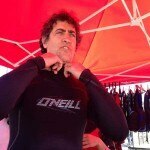 But I wasn’t worried about the temperature as I donned my wetsuit. I was more concerned about flying out of control and smashing into something or inhaling a few gallons of lake water. It had been a few years since I had water-skied, and had my own rust issues to overcome. 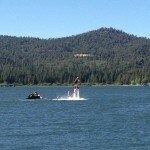 My fear was that flyboarding would feel more like waterboarding. 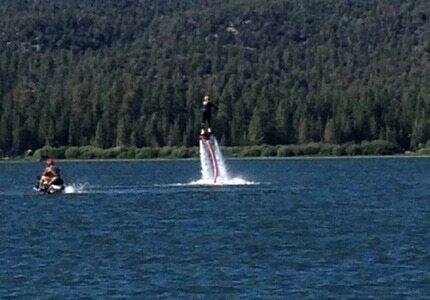 The last piece of equipment I donned was the flyboard itself, which had two boots affixed in which I placed my feet. It works on a water propulsion system; the board is connected by a hose to a jet ski and is propelled by the water from the jet ski intake. My first surprise as I left the dock was that I had to tow the jet ski! As I mimicked Superman flight position in the lake, with my arms straight in front of me, the water pushing out from beneath my feet propelled me with enough power that I could tow the jet ski which held my instructor. Propelling myself horizontally was simple; doing it vertically to achieve flight was another. As I started to aim the board down so it would propel me up, we were a safe distance from the dock, but I was never that far from the jet ski. As I improved my balance and inched higher above the water, my fear was I would land on the vehicle to which I was tethered. My instructor ran the throttle, giving me more power when I was in balance, easing up when he saw me in danger, and doing his best to keep me from becoming a soggy hood ornament. As I gained more control, I was able to soar higher and higher. At one point, I saw a rainbow below me, which I took as an encouraging sign. Then I actually saw a bird flying beneath me. I reached a high of about 16 feet above the surface. But the higher I went, the harder the impact was when I hit the water. A few of my landings were teeth-rattlers, but I was high enough to know when a big hit was coming and brace myself.